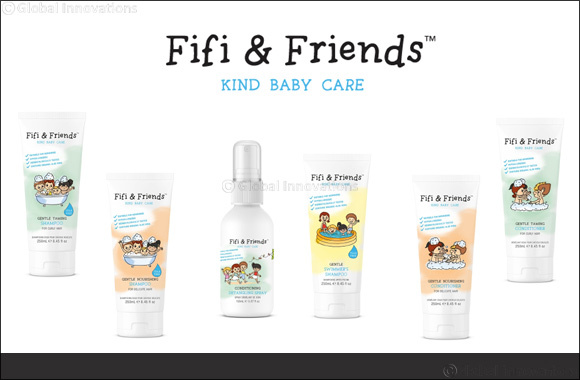 Everyday care for your baby's hair with Fifi & Friends! Dubai, UAE, November 07, 2018: Caring for kids is a lot of work but also a lot of fun! Not all kids enjoy showers or baths, so mums take great care to make each one a nice experience for their child and using a product that adds to the experience definitely helps. In teaching children the importance of hair and scalp cleanliness, parents should try to make shampooing a special treat, and in doing so, turn something that sounds like a dreaded event into fun. There's so many products in the market that promise to be safe for babies and kids, but there's one that's definitely a mommy favourite - Fifi & Friends. Businesswoman and devoted mother, Tamara Ecclestone, passionate about parenting, is the heart and brains behind Fifi & Friends. The brand's natural and effective bath & body products are all hypoallergenic, vegetarian (most products are also vegan) and wheat-free, as well as free from nasties such as parabens, sulphates, and silicones. This gentle baby shampoo infused with organic Aloe Vera cleanses and nourishes, for heathy and shiny hair, ensuring happy eyes with the brand's tear-free formula. This gentle swimmer's shampoo cleanses and conditions dry hair post-chlorine exposure, leaving locks soft, healthy and refreshed. This light detangling spray with organic Aloe Vera, known for its conditioning and soothing properties, helps for easy combing and flowing locks. Brushing out your little one's knots has never been kinder.